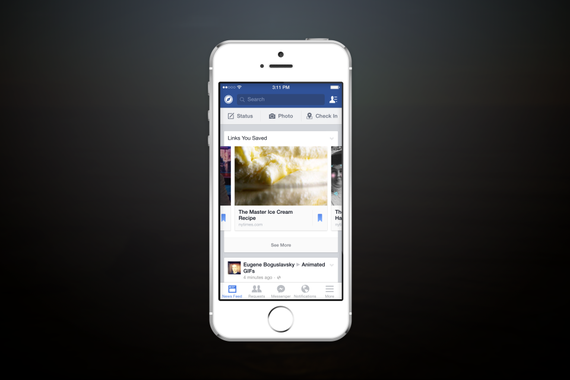 You Can Now Save Facebook Posts And Read Them later! Ever wanted to read through status updates of all your friends, only to find yourself running out of time? There are lots of services out there that will let you save webpages for offline reading later, but the Facebook feed is pretty dynamic, and you can't simply 'save' it for reading later, not without having to download a host of files. Fortunately for you, Facebook has just announced a new feature that will let you save Facebook posts and read them later! People find all sorts of interesting items on Facebook everyday. But not everyone has the time to explore right away. I myself have lost countless interesting links just because I forgot to return to them, and when I remembered, they were buried beneath thousands of newer posts. With this feature, you can save items that you find on Facebook to check out later when you have more time. With this new update you will be able to save items like links, places, movies, TV and music. All items saved are private, unless you indicate that you want to share them with friends. To save individual posts, click on the down-pointing arrow at the top of the post and there will be an option to save the post. To save other things that you would like to consume later, like the page of a movie or TV show, there will be an option to save that page right next to the Like button. To view your saved items, click on the “More” tab on mobile or by clicking the link on the left hand side of Facebook on desktop. The list is organized by category. Swipe right on an item to share it or move it into your archive list. Facebook also indicates in the announcement that they might show you reminders of your saved items in the News Feed. If you don't see this option yet, don't worry. The feature will be rolled out to users over the next week. So you'll soon be able to follow every single links in your newsfeed that you find interesting.